Nairobi (Agenzia Fides) - In the urban area of Nairobi, there are about 60 thousand street children and about 22 thousand under-age refugees. 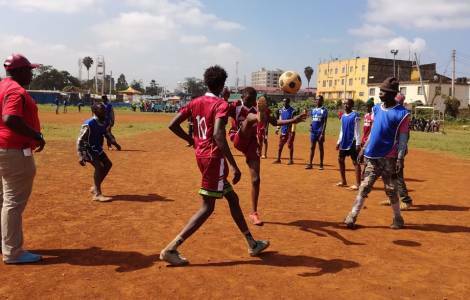 Thanks to the development of a project that uses sport as a driving force, we want to offer life alternatives to street children and under-age refugees in Nairobi. We are talking about Boresha Maisha which was launched in spring 2017 by the Medical Collaboration Committee (CCM). In the great slum of Mathare, the CCM is committed to defending and assisting girls and boys and street children through an individual psycho-social path aimed at school reintegration, vocational training and reintegration in the family. "The project will last three years, during which 50 social workers, 15 members of the Community Health Committees and 120 community social-health workers will be trained to adequately address the problems of street children, such as the abuse of drugs and sexually transmitted diseases", according to the note sent to Fides by the project leaders. "We will defend and assist girls and boys and street children. Our goal will be first of all to identify the situations of hardship, reach them and offer a real possibility of change. Through sport, 500 children will face life in a different way, feeling part of a team, in a positive environment", says CCM. Last December, the first tournament for street families was held in partnership with other organizations in Nairobi that deal with street children.